It’s estimated that 6.4 million American children between the ages of four and 17 have been diagnosed with Attention Deficit Disorder (ADD). Though the majority of people associate ADD with childlike behavior, adults can certainly have ADD, as well. 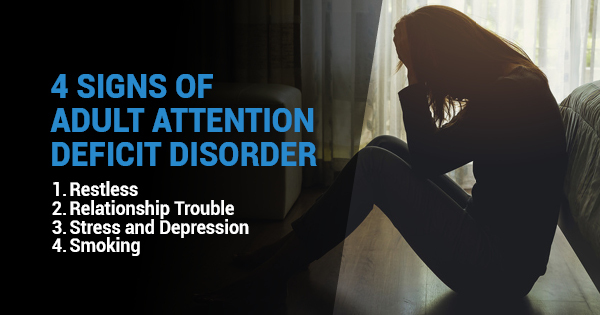 These cognitive issues aren’t the end of the world, but they can make work, school, and other aspects of life difficult if you’re unaware of your condition. That’s why it’s important to know for sure whether or not you have adult ADD. Restless — Though children with ADD seem overly energetic, adults typically just feel restless and edgy. Everyone is restless every once in a while, but if you constantly are feeling restless, you might want to schedule ADD testing. Relationship Trouble — Adults with ADD typically struggle much more than others with new and existing relationships. Though every new relationship has its ebbs and flows, when ADD is involved, the negatives seem to amplify. Stress and Depression — Adults with ADD are three times more likely to suffer from stress, depression, and other emotional issues that often cause missed days at work. Depression and stress can certainly affect anyone for a variety of reasons, but paired with other symptoms could mean a cognitive disorder. Smoking — About 40% of adults with ADD smoke, compared to only 26% of the general population. Since nicotine is actually effective for combating some of ADD’s negative symptoms, adults with ADD seem to smoke quite often. Again, scheduling an adult ADD assessment is the best way to make sure you do or do not have any cognitive disorder. ADD testing can help you better understand your diagnoses (or lack thereof) and the next steps you should take. If you want to learn more about adult ADD assessments or schedule dyslexia testing or any other form of neuropsychological testing, contact the Center for Cognitive Assessment right away.